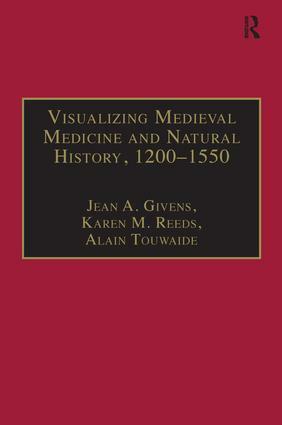 Contents: Introduction, Jean A. Givens, Karen M. Reeds, Alain Touwaide; Image, word and medicine in the Middle Ages, Peter Murray Jones; Latin crusaders, Byzantine herbals, Alain Touwaide; The illuminated Tacuinum sanitatis manuscripts from northern Italy ca. 1380-1400: sources, patrons, and the creation of a new pictorial genre, Cathleen Hoeniger; Erudition on display: the 'scientific' illustrations in Pico della Mirandola’s manuscript of Pliny the Elder’s Natural History, Sarah Blake McHam; Reading and writing the illustrated Tractatus de herbis, 1280-1526, Jean A. Givens; Leonardo da Vinci’s anatomical studies in Milan: a re-examination of sites and sources, Monica Azzolini; (Hu)moral exemplars: type and temperament in cinquecento painting, Piers D. Britton; Leonardo da Vinci and botanical illustration: nature prints, drawings, and woodcuts ca. 1500, Karen M. Reeds; The uses of realism in early modern illustrated botany, Claudia Swan; Index.